Spice! If ever a one-word description was needed to describe a nations’ propensity towards its food then spice would be the perfect one for India. 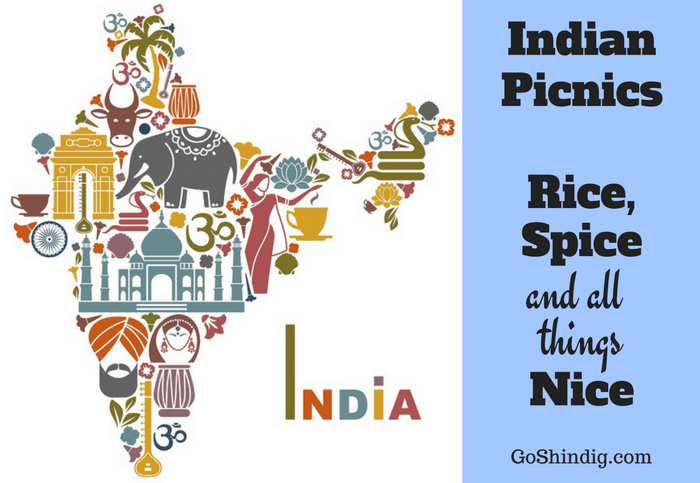 An Indian picnic, therefore, tends to be a spicy affair although this doesn’t necessarily have to be the case. As well as the plethora of spicy options open to you there are also some delicious, fairly simple, plainer foods that are just as authentic as anything you could throw some garam masala at. With India being as populous as it is there are naturally lots of regional variations of classic recipes within the country. From Bengali, Gujarati, Punjabi, Goan cuisines to name a few, from north, south, east and west each area has its own distinct style. For example, in the northern part of India you are more likely to be welcomed with food rich in dairy such as ghee or paneer and snack on samosas or beautiful naan bread. In the west, due to its close proximity to China, you are more likely to get sweeter tasting curries that aren’t so spice complex. Whatever the region the food originates from though we can be certain of one thing – our Indian picnic menu is going to be intriguing, different and full of aroma and flavor whilst at the same time being visually stunning. I shall attempt to guide you through a few suggestions for your picnic encompassing all facets from bread and dips to snacks for everyone to desserts and entertainment. Chapati is the first Indian food I remember eating at a friends birthday party. I was around eight or nine and to this day remains a firm favorite. It is a thin flatbread that is generally six or seven inches long. You could possibly mistake it for a small crepe. But trust me, this does a lot better job of adding sustenance to dips or spreads. Made with just whole wheat flour, salt, water, olive oil and butter, chapatis are simple to make and an essential to any Indian feast. Naan bread is an absolute staple of an Indian take-out for me. I personally find that rice fills me up for the meal as a whole. So I use the naan alongside my curry to take away heat and add a bit to bulk and texture. Traditionally it is cooked in a tandoor. This is a clay oven and is perfect for your picnic due to its versatility. 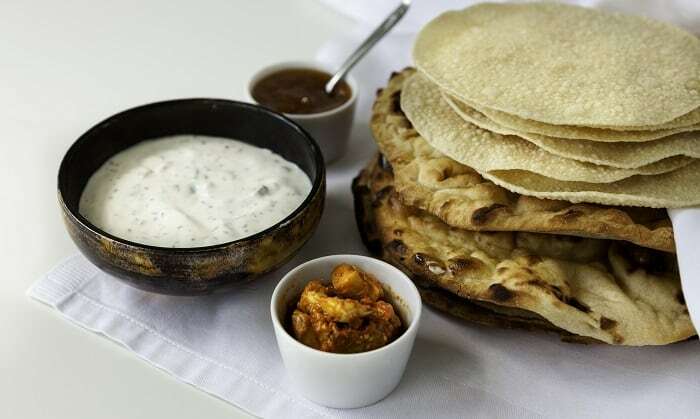 Whilst the chapati is quite thin and can sometimes be a bit delicate, the naan is thicker and a lot more robust. It can be used for dipping or stuffing. I like to open it up like a pitta and put my curry inside. Indian dips and condiments are as eclectic as the rest of the cuisine. There are many traditional varieties you can discover as well as some newer, trendier ones. From sauces to spiced vegetables and chutneys, the list is almost endless. Please read on for some of the best-loved and easiest options to provide a tasty snack for your picnic. 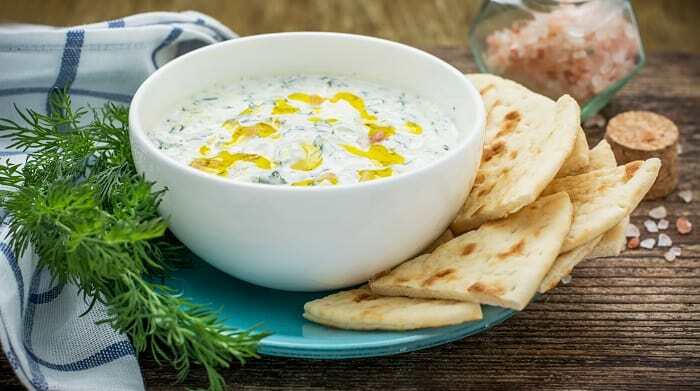 Raitas can come in all sorts of flavors like tomato, beet, carrot, and potato but perhaps the most famous is cucumber and mint raita. You can use it as a dip or a spread. Perhaps most useful of all, you can use it as a palate cleanser that dissipates spicy food. It is a breeze to knock up this tasty little treat which makes it an Indian picnic essential. A lovely accompaniment I like to put on my papadum is an onion based chutney. You make it using a medium onion, chili powder, mint leaves, a spoonful of tomato ketchup and a spoonful of mango chutney. You can play around with measurements to suit your taste. But get it right and you will get warmth from the onion and chili and coolness from the chutney to go along side your crispy papadum. Schezwan sauce is a bit of a crossover Indo-Chinese dish but something that certainly ups the stakes when it comes to heat. This should certainly not be mistaken for the stir-fried sauce that you can get from Chinese dishes. This is a full-bodied Indian inferno. After tasting this you better hope you took up my suggestion for the cucumber and mint raita as your mouth will certainly need cooling. Pickles are used in almost all Indian regional cooking. Fruit and vegetables alike combine to create sumptuous pickles that are a must-have condiment for your picnic. Some delicious examples include cauliflower, mango, chili, garlic, all which can be enhanced by Indian spicings. The great thing about Indian cuisine is that you can consider the majority of it as finger food. I remember friends eating their curries by scooping it up with their bread. Although this might not be advisable in a picnic setting due to possible stains on the picnic blanket we still have a vast selection to choose from for our meal. Samosas are the most obvious choice to go for first. They are the epitome of finger food and you can adjust them to suit any fussy eaters out there. 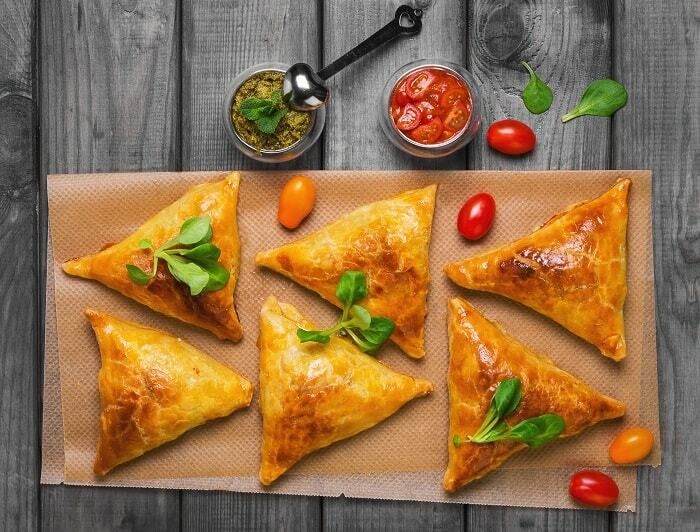 Available in meat or vegetable varieties, samosas are equally delicious hot or cold. They can be spicy or mild making them suitable for all palates. They can be a little tricky to make but that’s more to do with the list of ingredients required. If you can find some local store that sells them I would suggest that. Pakoras are another versatile Indian finger food. Just like samosas, there are meat and vegetable versions but unlike samosas, the ingredient list is minimal meaning pakoras are more readily available. They are made by dipping your meat or veg in a gram flour coating and then deep frying. I love chicken pakora but you could also use cauliflower, spinach, zucchini or onion to name a few. Ideally, you serve pakoras hot but they are just as nice cold in my experience. Chicken skewers are always a favorite when I’m at a picnic. Mainly, because it’s a big chunk of meat that you don’t always see outside of BBQs. And also because you can do so much with them. You can eat them as is, with any number of spices available to you. They are equally tasty with a dip or, if the mood takes you, between two bits of bread with some salad. Because they are pre-made you don’t need to worry about sauce leaking everywhere. And storage is very easy thanks to the skewers. For the sake of our picnic, I would definitely suggest tandoori chicken skewers. Guava cheese is an especially nice Indian dessert that can be used in your picnic. It has the air of a fudge about it and is definitely as sweet as fudge is. To make Guava cheese use guava, sugar, butter and lime juice. You can then chop into bitesize pieces, making it an ideal snack for children and adults alike. Halwa comes in many forms but is equally tasty no matter which you choose. Because of my love of cashew nuts I really enjoy Kaju Halwa. It probably doesn’t look much like a dessert. But one taste is all it will take to change your mind on this little gem. For those of us who are looking for a little more than just food at our picnic, we can immerse ourselves deeper in the Indian themed day with a couple of games. You think soccer is the biggest sport in the world? Well, it is, of course, but try telling that to your average Indian. The favorite game in those parts is cricket and they go bat sh*t cray for it. Luckily for us, cricket, in its simplest forms is a very easy game to learn and play. French cricket (I know) is a very picnic-friendly form of this game which can be played on grass or sand. A set like this is all you need for hours of fun no matter the size of your party. For larger picnics that are in need of a new fun game for many people, there is the wonderfully nuts Kabaddi. The basic premise of the game is that there are two teams who take it, in turn, to send one of their numbers forward to tag a member of the other team. They then have to try to make it back to their own side of the court. The nuts bit of this game though is that when your guy goes into enemy territory they must not breathe in. The way to prove this is by shouting kabaddi kabaddi kabaddi continuously until you have made it back. You can view the game in the video below for better understanding but please give it a try. It is extremely fun and funny when played with friends.